Life is about Change. You may have noticed we changed our name to combine NurseWorks and PawWorks on to one convenient page. 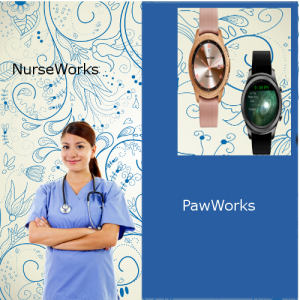 We will continue the same format with Best Nursing Home Inspection, (now NurseWorks and now add our Samsung Watch Face information here as well. Every Day I work on Watch faces.But, the ones I love best are Christian watch faces.I always start with prayer, and then when an idea surfaces, I will put my heart and soul into making content that will inspire and remind people of who they are in Christ. Most of the Watches are given away for free for the first couple of weeks, and then the normal Samsung fee is added.I do this to reach people , and to honor God for the talent He has given me. These watch faces are very complicated and can take up to a month or more to create .I am currently working on a 24 hour watch face that will change every hour of the day. It is about the verse in Philippians 4:8. One of my favorites is watch faces is, “They that wait upon the Lord”. It brings a smile to my face as I imagine people all over the world singing this song through the day, reminding themselves That waiting upon the Lord will renew their strength. Look for changes in the near future. I want to be able to give 100% of my time and energy and efforts to serving the audience that God has given us .But I have to work full time to support my family.I would like to put out more watch faces. In the short few months that I’ve been doing this, we have reached over 3,00 people in 48 countries. As you can imagine, making watch faces about Jesus on the Samsung is not a lucrative thing. Up to this point, this ministry has largely been a sacrifice. Our greatest need at this time are people who believe not only in what we have done but who believe in what we are creating. We need partners who believe in the value of digital ministry and who are willing to help us continue on this mission. Not only do I want to create more content, but I also want to create better content. I have ideas for super ambitious projects and video ideas, but in order to make this happen, it requires help. I would be incredibly grateful. Whether your support is through $1 or $100 a month (or even if money isn’t a possibility and all you can do is pray) I would be incredibly grateful.